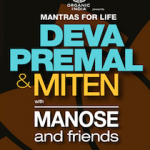 Back in Edmonton after their sell out concert last year, Deva Premal & Miten return with their beautiful band for a magical evening of sacred mantras, love and healing on Friday September 19th at the Oasis Conference Centre. Doors open 6:45 pm. Floor plan and concert description below. For more information, please visit their website: www.DevaPremalMiten.com.